Travelers who haven’t yet tried a cruise tell us that popular cruising myths like “I’ll get seasick” and “I’ll feel claustrophobic on a ship” are among the reasons they’ve not yet crossed the gangway. At the same time, compelling lures, like commercials you see on TV of families sliding down onboard waterslides or of couples gazing out to sea from their private balcony are tempting. Even more tantalizing: friends who have cruised and who come home from vacation just raving. Cruises offer great value for your vacation dollar because the fares include nearly everything you’ll need for a fantastic trip: food, accommodations, daytime and evening entertainment, and transportation between travel destinations. We regularly see fares on mainstream cruise lines for under $100 per person, per night, which is astonishingly cheaper than you’d spend on land for a hotel, dinner, and a show. On some lines, kids even sail free or at discounted rates when sharing a cabin with two adults. Looking for luxury? 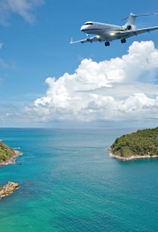 Upscale lines are even more inclusive, with alcohol and soft drinks, gratuities, shore tours, onboard spending credits, and even flights often bundled into the base price. On a cruise, you unpack once and your floating hotel takes you from city to city or from island to island and there’s no need to mess with train or ferry schedules, or lug your suitcase along cobblestone streets. Every morning, you’ll wake up in a new place. 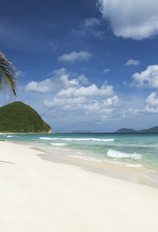 Can’t decide between St. Lucia and Barbados, or Italy and Spain? Why choose? Pick an itinerary that visits all the cities on your wish list. From tots to teens, grandparents to grandkids, cruises are fun for all ages. If you’re struggling to find a vacation that your five-, 10- and 15-year-old will all love—and that has adult activities, too—ships now have extensive kids’ facilities, split by age. Teens have their own cool hangouts, far away from the play areas for the little ones (and certainly a nice distance from parent-friendly pools and bars). How can you not love a trip that features video games and swimming pools, while offering time for families to be together at dinner or on shoreside excursions? And parents can even sneak in a romantic dinner alone, by taking advantage of late-night hours in the kids’ club. The ideal cruise ship for one person may be a mega-ship outfitted with onboard rock-climbing walls and outdoor movie theaters, while another will prefer an intimate ship with an upscale ambience and someone else will want the seafaring experience of a masted tall sailing ship. Luckily, all those different types of cruise ships exist, from French Country Waterways‘ 12-person river barges to Royal Caribbean‘s 5,400-passenger Oasis of the Seas. More options range from the luxurious Seabourn Odyssey to the minimalist sailing ships of Star Clippers, and even to ice-strengthened expedition ships like Hurtigruten‘s Fram. Today’s cruise ships are designed to keep everyone happy. Want to pamper yourself at the spa while your spouse hits the casino? Or lounge in the sun reading a book while your family plays basketball. You can go to an educational lecture, a wine tasting, a computer class, or a dance workshop; paint pottery, play bridge, learn a language, or do yoga; dine at a casual buffet, a fancy sit-down restaurant, a sushi bar, a diner, or a steakhouse; and watch a movie, a comedy routine, a song-and-dance show, or live music performance. And if all you want to do is nothing while the ship sails from port to port you can do that, too. Because cruise vacations package together transportation and accommodations, they’re very easy to plan. Pick your ship, itinerary and cabin, and away you go—no searching for hotels in your price range, no coordinating travel between cities. You can even get your travel agent to arrange your airfare for you—or choose a departure port within driving distance to eliminate that extra planning step. Groups also find cruises a cinch to book. Cruise lines have plans in place for group travel, eliminating the hassle of coordinating your 20 family members and friends from around the country who want to vacation with you. Book enough cabins and you’ll get extra perks, including a free fare! If you’re concerned about being stranded in the middle of the ocean, relax. Cruise ships are like floating cities with everything you could possibly want onboard. Today’s vessels are outfitted with Wi-Fi, cell service, and satellite TV, so you can stay in touch with the real world during your cruise (if you even want to). Onboard shops sell the toiletries you forgot to pack, medical centers can provide meds or a doctor’s services if needed, and laundry facilities let you wash your clothes mid-cruise so you don’t need to over-pack. Of course, there’s also the fun stuff like gyms, multiple restaurants, movie screens, spas, swimming pools, theaters, and discos. And in the rare emergency, there are always enough lifeboats for everyone onboard. Always wanted to visit Asia but are nervous about the language barrier? Curious about the Middle East, but nervous about country customs? A cruise is one of the best ways to see the most exotic and foreign destinations in this world in an easy way. Itineraries offer calls at major cities and picturesque villages, all of which will be regional highlights, so you don’t have to do the research on the best places to visit in an unfamiliar destination. If you’re uncomfortable with independent sightseeing in a new locale, simply take a ship’s tour with English-speaking guides. Or team up with more experienced travelers you meet online or onboard to share a cab or private guide. Anyone who’s watched “The Love Boat” knows that there’s a romance to sea travel. The wind in your hair, the vistas of endless ocean, and the stars twinkling above all set the mood for love—they may be cliches, but they’re real experiences onboard! If you want to rekindle the spark with your sweetie, a cruise vacation provides plenty of together time—sharing side-by-side lounge chairs by the pool, a table for two at dinner, dancing in the evening, or sharing quality time onshore. 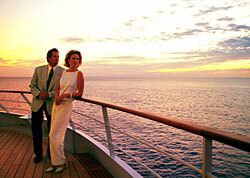 Cruise lines also have special packages for honeymoons, vow renewals, and weddings onboard and onshore. If you love to meet people from around the country—and the world—cruising provides a wonderful opportunity to make new friends. Even before you embark, you can connect with cruisers on Cruise Critic’s Roll Call forums and create groups to go on independent excursions. Onboard, you’ll meet people at your dinner table, at the piano bar or by the pool. The person seated next to you might be from Paris, Texas, or Paris, France; London, Ontario, or London, England. Kids can find playmates their own age during youth activities, so they’re not always with adults or their older or younger siblings. Looking for Mr. or Ms. Right? We have proof that many long-term relationships begin during a vacation at sea. What are your top reasons for cruising? Share your thoughts by adding a comment below!